The Streets of San Francisco Tour explores the back alleys of North Beach's Little Italy. Take up-close photos of the Trans-America Pyramid. See the Barbary Coast and San Francisco's historical supper clubs. Visit these Neighborhoods and find out how they have transformed from scandalous to sparkling. 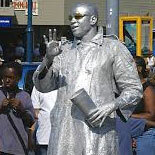 The Streets of San Francisco Tour has quickly become a must-do activity among visitors. The guides strive to provide an excellent experience for guests, with safety and fun as the objectives of each tour. Guides retain the freedom to personalize their tours with their personality and to cater to their rider's needs. If riders are experienced the tour can be embellished; if riders are novice the tour can slow it down a bit. Bottom line - no two tours are alike. 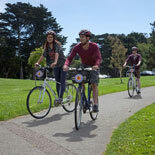 Ride around the Giant's AT&T Ballpark, into the culturally rich Mission, Castro and Haight-Ashbury neighborhoods. See the ever-changing street art and the locals that rule each area. Cruise Nopa and take in the charming Painted Ladies of Alamo Square. Little Italy, Alamo Square, Polk Gulch, AT&T Ballpark, Aquatic Park, Fisherman's Wharf, the Mission District and many more are just some of the areas that are along the Streets of San Francisco Tour's 15 mile route. Each one is unique on its own. Before visiting the Civic Center, ride Polk Gulch, San Francisco's original gay neighborhood and finish your ride in the Aquatic Park. The journey concludes at the festive Fisherman's Wharf. The Streets of San Francisco Tour covers everything! 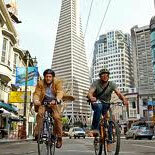 Make your reservations and get your eTickets now to see San Francisco up close on a bike! Difficulty: This ride is relatively flat and is comprised of street bike-lanes and bike-paths. 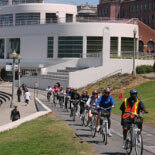 Riders must know how to ride a bike comfortably in an urban setting to love this unforgettable tour! It is 4 hours and 15 miles long. This tour operates from March to October, departing daily at 11:00 am. Please arrive no later than 15 minutes prior to tour departure time for bike fitting and registration. You will be stopping for lunch and break. + Reservations are required 48 hours in advance of desired tour date. + Rentals are weather-sensitive. Under weather conditions that are deemed non-operable, they reserve the right to cancel any scheduled tour within 24 hours of the actual tour and will notify you at that time. Full rain cancels tour unless client wishes to conduct tour regardless of weather. 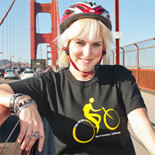 + Adult Riders must be in good health and able to ride a bicycle. + Helmets are included and required for riders under the age of 18. Riders 18+ have the option to use a helmet provided with rental. Feel free to bring your own if you'd like.